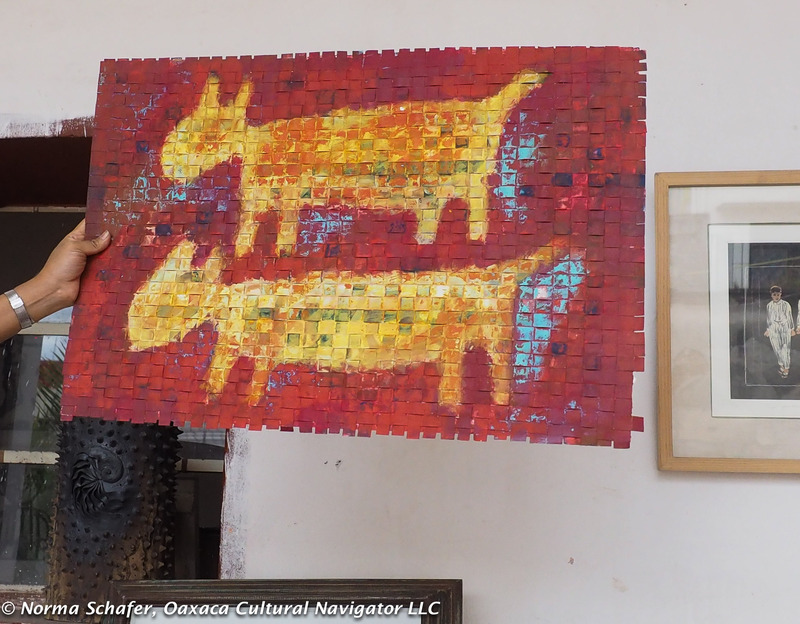 Oaxaca artist Gabriel Mendoza Rodriguez lives obscurely and paints large. 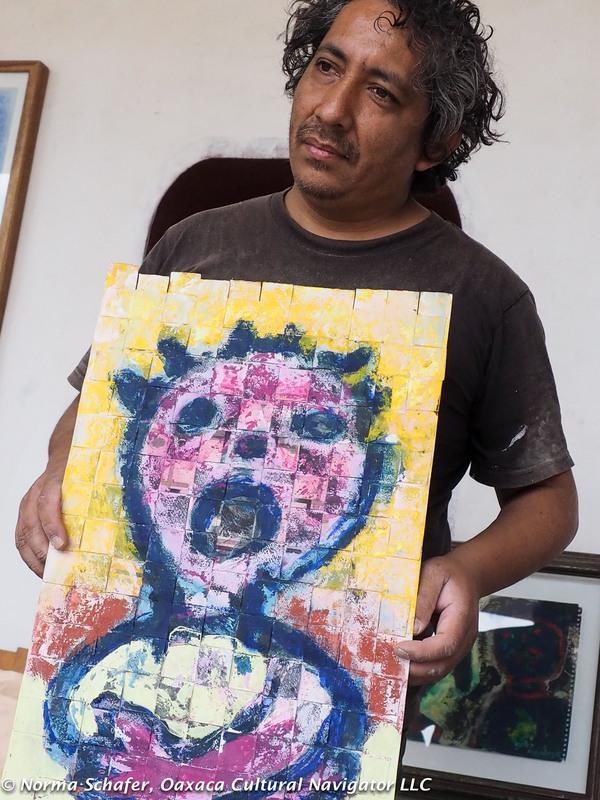 His works are filled with color, humor, sadness, political and social commentary. They are playful and grotesque, childlike and sophisticated, simple and complex. 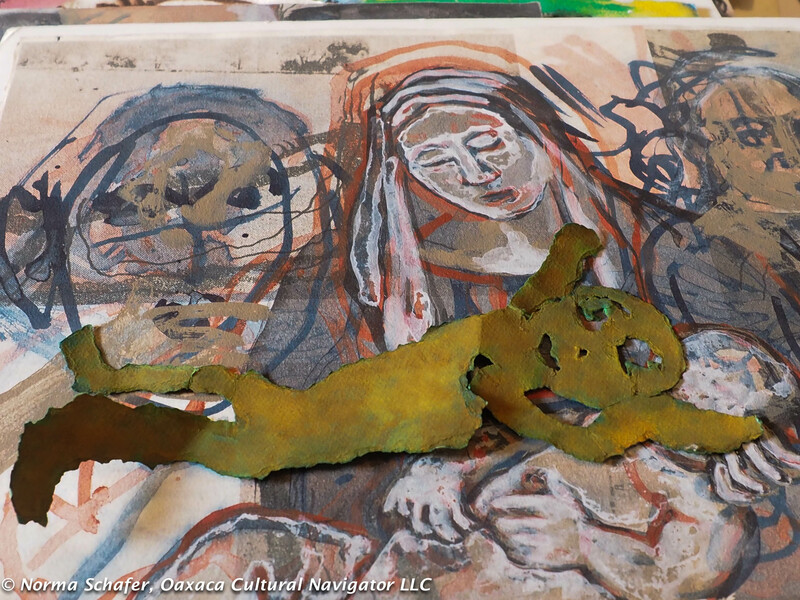 Look into Gabo’s eyes and you know that he feels what he paints — street children, prostitutes, farm animals. 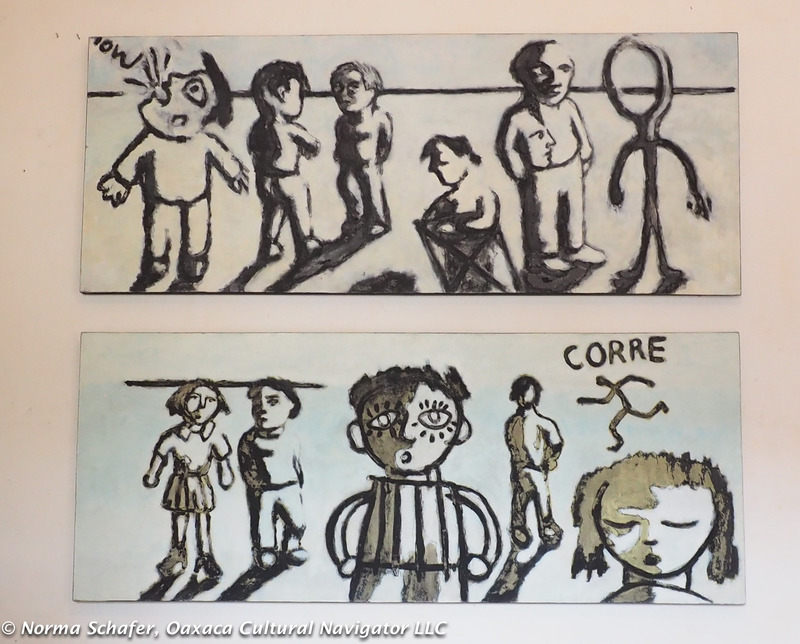 These are interpretations of life as he knew it growing up in Mexico City and what he sees here in Oaxaca. I look at Gabo’s work and think back to Mexico’s political satirical movement started by Jose Guadalupe Posada. Diego Rivera revered Posada. 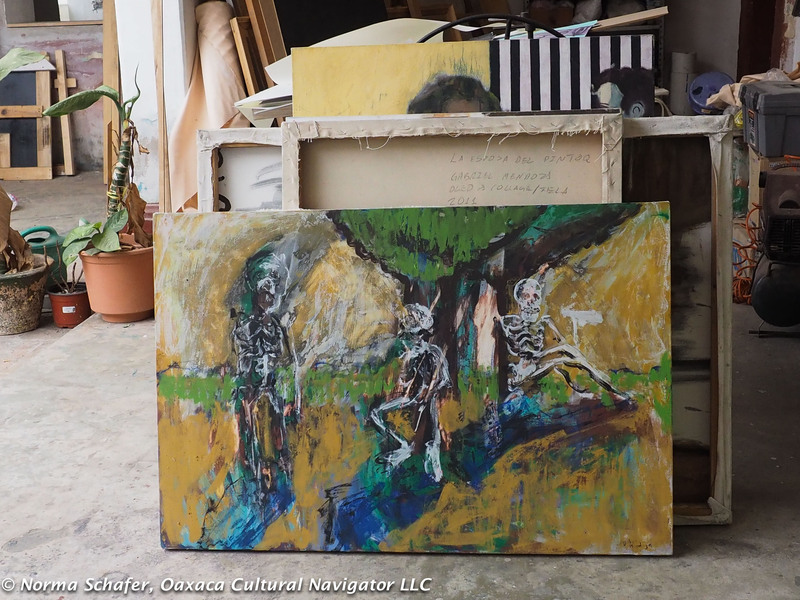 So did his contemporaries David Alfaro Siquieros and Jose Clemente Orozco. Many of their paintings seem like a cartoon. 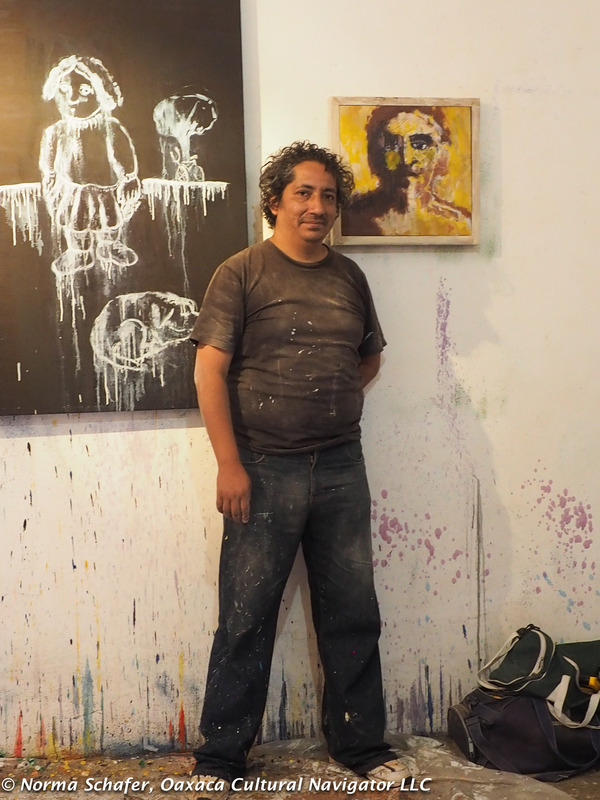 The satirical cartoon is a hallmark of Mexican art and I see it, especially, in Gabriel Mendoza‘s work. 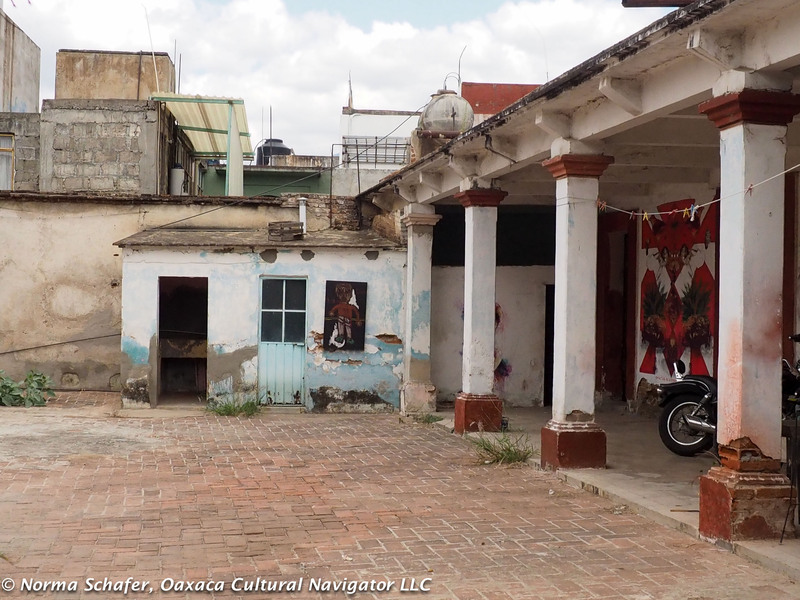 Gabo lives and works within the second courtyard of a vintage colonial adobe home in the historic center of Oaxaca. The front door is now metal with only the street number visible. Inside, the first courtyard is filled with old restaurant equipment and surrounded by vacant rooms. Walk further back and you enter an expansive brick patio where Gabo works. 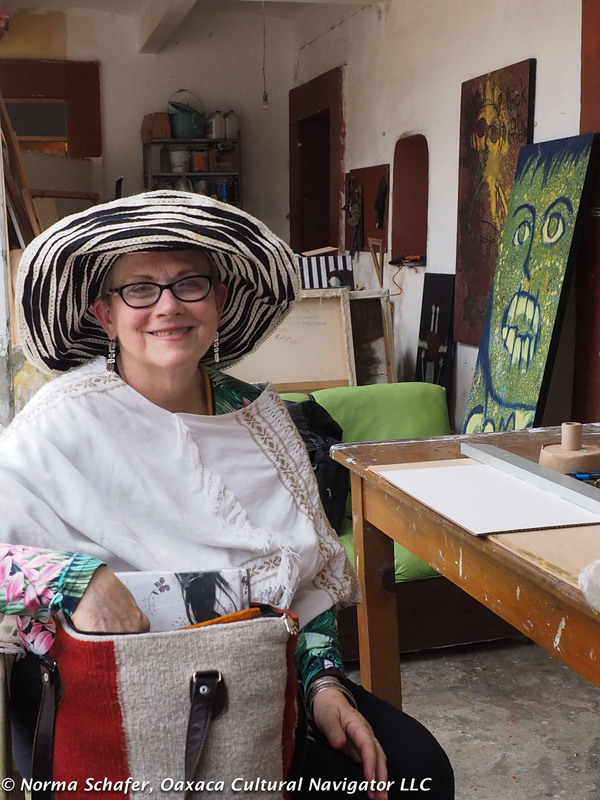 Here are easels, a printing press, a table saw for building frames for paintings and doors, murals and drawings on the crumbling stucco walls. 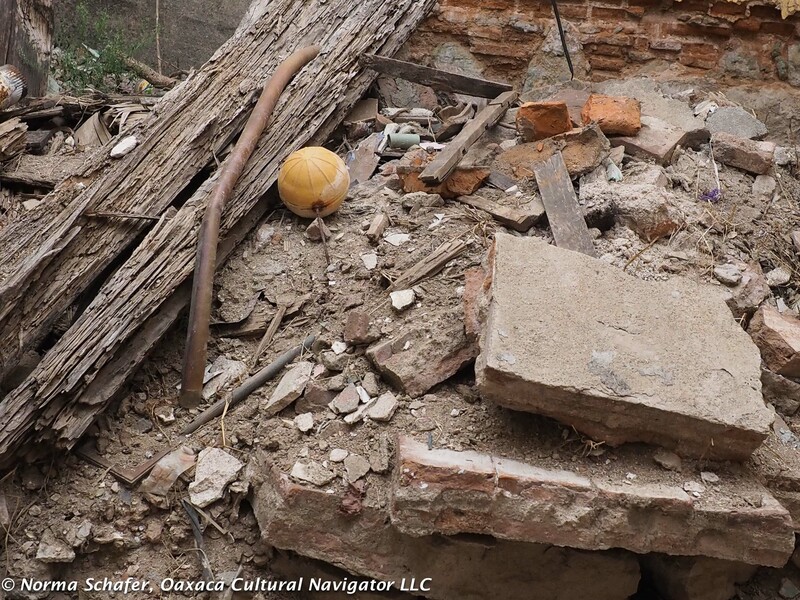 Beyond are abandoned rooms where only debris and termite eaten timbers lay waiting for rehabilitation or burial. Work is in progress. This is studio space that is used by several artists and Gabo hopes that more will come here to create and collaborate. Please feel free to go and knock on the door. 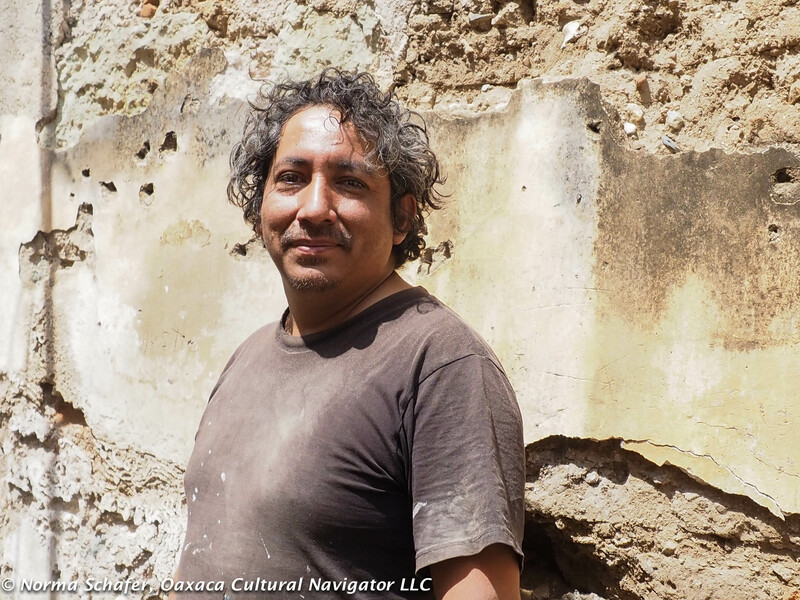 This is a part of Oaxaca worth exploring and a talented young man you will want to meet. With thanks to Dumpster Diver Diva Ellen Benson for the introductions! Above left, my artist friend Hollie Taylor visiting from North Carolina. 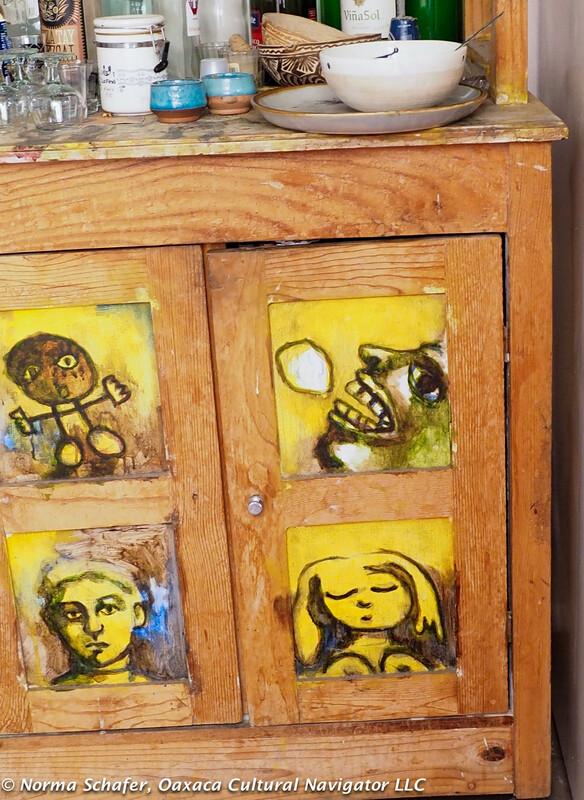 Above right, a painted kitchen cupboard. This entry was posted in Mixed Media Art, Oaxaca Mexico art and culture, Travel & Tourism and tagged art, cartoon, contemporary, drawing, Gabo Mendoza, Gabriel Mendoza Rodriguez, Mexico, Oaxaca, painting, satire. Bookmark the permalink.